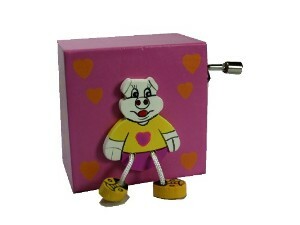 These wonderful music boxes each have a hand wound 18 note mechanism inside and are made in wood with a painted design. IMPORTANT NOTICE! Please be aware that musical movements do contain small parts. Therefore they are not suitable for use by very small children who should be supervised . If you are unsure about suitability, please ask one of our staff for guidance.